From plastics to cosmetics, the impact of our YInMn blue discovery that started with science but goes beyond the color and pigment industry. But materials chemist Mas Subramanian and his team of researchers are not done yet. They continue to pursue more pigments and make the world even more colorful. The notion of a substance capable of imparting color onto another material has generated much excitement and curiosity in science. Recently, Bloomberg visited our campus and spent a day with Subramanian to delve into the renowned accidental creation of the new pigment YInMn blue he and his students stumbled upon in 2009. This was his 57th career patent. This in-depth feature article chronicles Subramanian’s process and captures his thinking that led to the breakthrough moment, seeing what others might not have seen in a moment of pure imagination. The chemist reflects on discoveries that have yet to be made as the world awaits the next new color, which not only has the potential to generate hundreds of millions of dollars annually but also to transfix the world as we know it. Subramanian holds the Milton Harris Chair Professor of Materials Science in the Department of Chemistry at OSU. Below is an excerpt from the Bloomberg Business article. Mas Subramanian, the biggest celebrity in the uncelebrated world of pigment research, glances at a cluster of widemouthed jars containing powders in every color of the rainbow, save one. He’s got OYGBIV. “We’re getting closer,” he says brightly. He points to a jar of reddish-brown dust, smoky and rich as paprika. Fetching, but it isn’t what he’s looking for. During his nine-year sojourn into the strange, finicky realm of color, Subramanian, a materials science professor at Oregon State University at Corvallis, has grown infatuated with a form of chemistry that he, like many of his peers, once considered decidedly low-tech. His renown derives from his accidental creation, in 2009, of a new pigment, a substance capable of imparting color onto another material. YInMn blue (pronounced YIN-min) is an amalgam of yttrium, indium oxide, and manganese—elements deep within the periodic table that together form something unique. 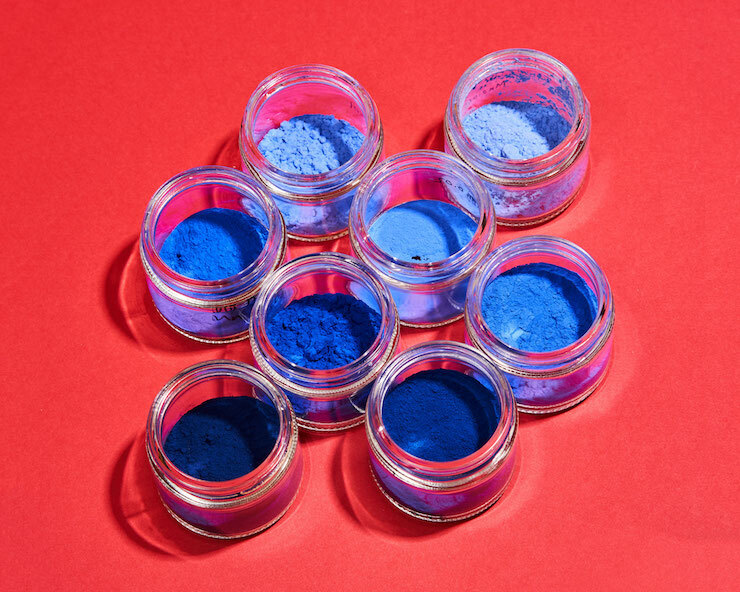 YInMn was the first blue pigment discovered in more than 200 years. It isn’t only the exotic blueness that has excited the color industry, but also the other hues the pigment can generate. Subramanian soon realized that by adding copper, he could make a green. With iron, he got orange. Zinc and titanium, a muted purple. Continue to the full article on Bloomberg Business. Read more about Mas Subramanian’s research, YInMn blue, the Crayola crayon Bluetiful inspired by the pigment and the other remarkable ways the serendipitous discovery has rippled through industry and through our imaginations.